The Duchess of Cambridge dusted off a treasured artifact from her burgeoning royal coat museum yesterday. 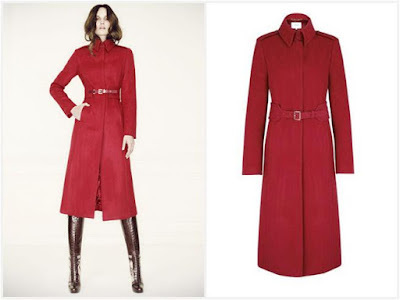 First spotted in 2011, when the Cambridges teamed up with Crown Prince Frederik and Crown Princess Mary to visit a UNICEF facility, the coat was originally worn with a separate belt and some tall boots for a cozy covered look. In 2012, the belt from the coat model appeared for a rugby match in Wales (an event without much of a full length view, so I'm skipping a pic. Click here to see). 2013 gave us a better view, with black tights and black pumps. And now the coat is trying its hand at a hat pairing. Chocolate brown accessories and a ponytail freshen up the repeat. The question is...which coat styling is your fave? Moi, I love the way a tall boot brings out the military details of this coat - the belt, the high collar, the epaulettes on the shoulders - and highlighting that structure makes the look.